How you met: Both in England for work. Proposal: Overlooking Maroubra Beach in Sydney. 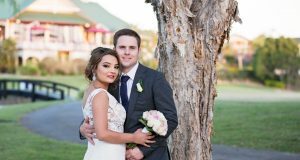 Ceremony: Amore Gardens, Currumbin Valley was the perfect choice for our ceremony with many locations to choose from. We chose a water/lake backdrop that looked stunning in our photos. Music: Variety of old and new music to get people dancing. Reception: Amore Gardens, Currumbin Valley. Theme: We chose a black and white vintage theme for our reception decorations. Our table centerpiece consisted of vintage lamps, mirrors and candle holders. Flowers: Divine Wedding Flowers did a wonderful job designing our flowerlily bouquets as well as pin-hole roses for the men. The white rose bouquets looked great and fit in well with the theme. Kyla from Divine Wedding Flowers did a great job and I couldn’t be happier. Cake: We chose a three tier square cake with black bows to match our theme. Our cake was designed by Yeners Cakes. Dress: A simple flowing white lace dress by Wendy Makin. Shoes and Accessories: I chose to keep the accessories simple in order to emphasize the beautiful detail of the lace dress. I chose a tear drop shaped diamond earring. Transport: Blissful Dubs. 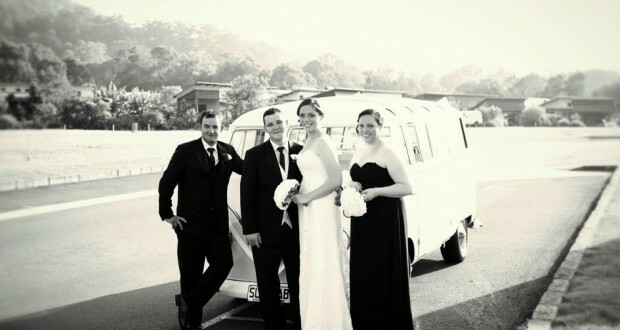 Arriving at the ceremony in Lola the Kombi was a great experience. She looked amazing in the photos. 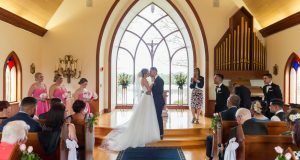 Photography: Our photographer was Martinia O’Sullivan from Life, Love and Light Images. We could not be happier when we saw her photos, she did a fantastic job. Our guests were impressed by how approachable she was and the effort taken to get the perfect shot. She certainly went above and beyond our expectations.